My tomato plants are heavy with tomatoes. 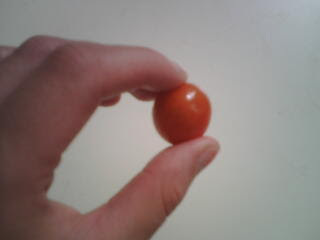 Alex ate the first one yesterday, the rest will be ripe soon. I can't wait until someday I live somewhere with a full garden and not just a 5' by 3' dirt and concrete box. It's been a busy week. I've been all over the place, its been rainy or hot. I spent the morning trying to learn how to format blogger templates, I got NOWHERE, if you can help, please contact me. In between, however, I have been baking, cooking, freezing. Early this week I made tamales, undaunted by the advice I read all over the internet saying how hard and time consuming they were. They were not hard. I started them around 5pm, we ate at 8. Two hours of cooking/processing time and an hour of steaming time seemed totally worth it. I used Elise's recipe, however, I poached then pulled some chicken and added it in with the vegetables, along with a portobello that needed to be eaten. I also used a fresh hot chili to make the sauce, and added a kiwi to the sauce as well, that also needed to be eaten. They were so good. No pictures, as they were eaten quickly. I made a blueberry cake. (See ugly picture below) Alex dubbed it "best yet", but I feel he says that a lot. I used the lemon layer cake recipe I love from Gluten-free Baking Classics but I altered it a bit. I had very little butter and no confectioners sugar, so I couldn't make a buttercream frosting like I would have liked, instead I made a marshmallow-y one. 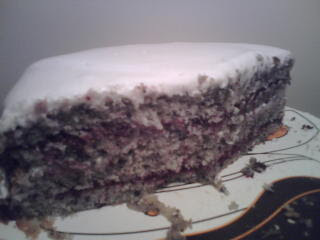 This cake isn't that sweet, but tastes strongly of berries. I love blueberries, and frozen ones are cheaper and taste the same once cooked than fresh ones. 1 cup frozen or fresh blueberries, pureed in blender or food processor. Beat in other ingredients, mix for 1 minute. Pour batter into two 9" round greased baking pans, bake at 350 for 35 minutes. Remove from pans, cool to room temperature. Cut each layer in half horizontally, so you have 4 cake layers. Spread one layer with blueberry filling, the next with frosting, the last with blueberry, then frost the top with the frosting and let it run down the sides. Puree the rest of the bag of frozen blueberries, or if using fresh about another cup and a half. Put berry puree in saucepan with 1/4 to 1/2 cup sugar, depending on your taste. Add about 2 teaspoons of lemon or lime juice. In a small bowl, mix 1 T of cornstarch with 1 T of cold water. Heat the berries to a simmer, add in the cornstarch mixture while stirring. Let thicken a bit, turn off heat and let cool. Combine first 4 ingredients in a metal or heatproof bowl over a pot of boiling water. Whip with an electric hand mixer (or by hand if you have strong wrists) for 7 minutes. Remove from heat, keep beating and add in vanilla, then butter one T at a time. Beat until cooled to room temp (approx), then use immediately. This was kind of an experiment. I had bought a bag of frozen strawberries thinking I would use it in the blueberry cake but decided I wanted a purely blue cake, with no mix of berries. 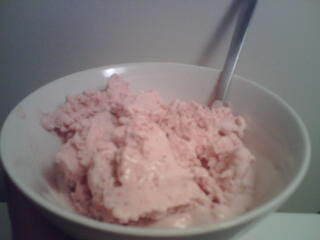 Instead, I made ice cream. With some cake in it. I used to decorate cakes at an ice cream store that made cake batter ice cream, and they would pour a while box of cake batter into the ice cream mix. Cake and ice cream go together like peas and carrots. Puree the strawberries with the sugar and vanilla. If you are allergic to raw fruit like I am, Cook the fruit gently at this point Put back into the food processor, add two slices cake, and pulse enough to break up the cake. Pour into a bowl, add cream and milk. Stir well, chill for an hour or so, and freeze in your ice cream maker. Can you tell it's been hot out? I don't want to cook anything when it's 95 degrees outside. 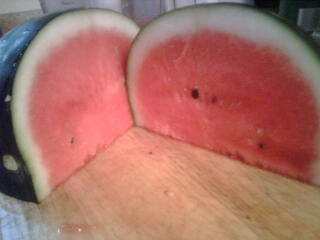 All I really want to eat is watermelon. This is so easy, and so good. 1 small watermelon, cut from the rind into chunks about 1"
Make a simple syrup from the water and sugar- mix them together in a saucepan and heat until sugar dissolves. Meanwhile, puree the watermelon in the food processor and transfer to a bowl. Add syrup, and a teaspoon of lime juice if you want. Freeze in ice cream maker. This is a variation on a pancake recipe I believe I have posted before. This makes thick, fluffy pancakes that are best when made about the size of your fist. Combine cornmeal, honey, and salt in a bowl. Stir in boiling water, cover and let sit for 10 minutes. Add milk, butter, baking powder, and egg. Stir in flour mix, xantham gum, and brown sugar. If you feel the better is not thick enough, add more flour mix. Let rest 15 minutes. Cook as you would normal pancakes. I imagine these would be excellent with blueberries. I will try soon. THIS cake (the blubes) was fantastic. And my dear, if you need to ever use my camera, just let me know! Your blog is amazing, my little mind is blown and so proud of you!!! OMG DELICIOUS PANCAKES!!!!!!!! I just made some.